The Pentagon is announcing today their plans for closing Gitmo as well as the location where the detainees will be incarcerated, a Capitol Hill newspaper is reporting. The report is likely to list the options for sending the prisoners somewhere else. We expect they will try to release a number of detainees somewhere in the Middle East, and bring the rest into the U.S. The Pentagon plan is also expected to detail just exactly how they and the president can legally accomplish the transfers without violating laws passed by Congress that tried to make the task impossible. 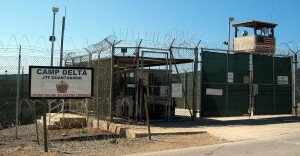 “Current law prohibits the use of funds to ‘transfer, release, or assist in the transfer or release’ of detainees from Guantanamo Bay to or within the United States and prohibits the construction, modification, or acquisition of any facility in the United States to house any Guantanamo detainee,” the Jan. 15 letter from Army Lt. Gen. William Mayville said. The whispered states on the list include Colorado, South Carolina and Kansas. We wouldn’t be surprised if the report omits which particular state is the finalist, and instead says the specific state will be determined after the Democratic primaries at a later date. U.S. Sen. Michael Bennet had nothing to say about today’s deadline, but U.S. Sen. Cory Gardner and senators from the other states issued a terse statement warning the Obama administration against the expected actions. Stay tuned, and lock your doors.